The Mariposa cutting board is a gourmet cheese board with tools. 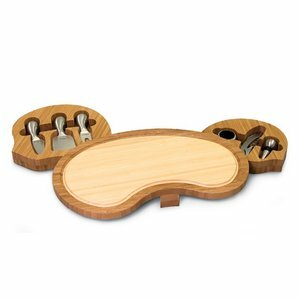 It's a two-toned board with wine and cheese accessories tucked away in two swing-out drawers. It measures 15 x 9 x 2in and is made of light and dark bamboo. The stainless steel cheese tools include: 1 hard cheese knife, 1 chisel knife (for hard crumbly cheese), and 1 cheese fork. The wine tools include 1 stainless steel waiter-style corkscrew, 1 drip ring, and 1 bottle stopper. Add wine, cheese, and crackers and you have all the makings of a fine evening. Two-toned bamboo; Wine and cheese accessories stored in two swing-out drawers.